In May of 2007, the haudenschildGarage collaborated with New York artist Lisa Tan. 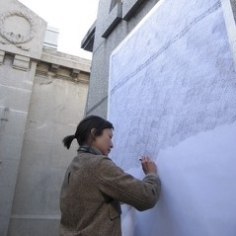 While in Buenos Aires she made a collection of grave rubbings from the Cementerio de La Recoleta and sent the Garage daily images and thoughts on her experience of the city. On September 5, 2007 Lisa Tan presented her project Recoleta at the haudenschildGarage and was in conversation with former San Diego Museum of Art director Derrick Cartwright and LAXART director Lauri Firstenberg. Provisionally titled Recoleta, this project began during my first trip to Argentina in August of 2006. 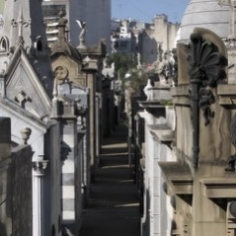 The Recoleta cemetery is located in a well-heeled neighborhood in Buenos Aires that bears the same name. Initially, this site piqued my interest when I learned that it is configured like a city. It is in fact a city of a couple hundred mausoleums—a distinctive and elite necropolis. The graves vary in style, density, and material. Some are ornate over-built structures that could house a small café, and others are minimal blocks of smooth granite. They all exist side by side along paths that branch off from main “boulevards,” mimicking the cosmopolitan surroundings just beyond the cemetery walls. To take this potent site into account, I decided to make grave rubbings of select mausoleums, while avoiding all literal and figurative aspects—including areas of text, image, or overly descriptive textures. Marble statuary, glass doors, bronze plaques, and crosses, all dissolve into a collection of black monochromes. En masse, they vary little from one rubbing to the next; they become voids that reflect of a repository of unknowable histories. 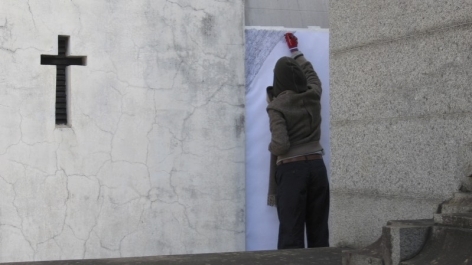 In 2010, artist Lisa Tan proposed a second chapter to her Recoleta project started in Buenos Aires in 2007. She reflected on how three years changed her perspective on the project and the collection of drawings born out of the experience. In May of 2007, the haudenschildGarage collaborated with Lisa Tan. While in Buenos Aires she made a collection of grave rubbings from the Cementerio de La Recoleta and sent to the Garage daily images and thoughts on her experience of the city. The guidebook read: “The cemetery’s giant vaults, stacked along avenues inside the high walls, resemble the rooftops of a fanciful utopian town from above”. It sounded compelling, given an emergent attraction I had to cemeteries—and so I packed a pad of 11 x 14 inch paper and some black pencils, and one day—after we arrived back to Buenos Aires from the northern Patagonian Pampa—I went to the Recoleta Cemetery and spent a couple days making grave rubbings—avoiding any text or overly decorative textures. The walk from the hotel to the cemetery took me past a small bakery, then the Israeli Embassy Memorial (it was bombed in 1992), then across Avenida 9 de Julio—the iconic wide street that bears the white obelisk, toward an ornate fountain near the Brazilian and French embassies, fancy retail spaces, a grand hotel, and then finally, a family of huge Banyan trees. Along this route, the international modernist apartment buildings, that are so plentiful in downtown Buenos Aires, give the walk a decidedly cosmopolitan tone. This became part of a ritual of going to the cemetery and coming home, and these nighttime walks would inform another work of mine. Both inside and outside of the cemetery I was fascinated by the built space around me and how each had formed its own image of the unknowable. When I went back to Buenos Aires the next time, it was with the generous assistance of the haudenschildGarage. I had decided that I wanted to make very large grave rubbing drawings (84 x 48 inches each) to capture the scale of the structures. It took the better part of a day to make one. I thought they would turn out to be impressive monochromes that had a weight and aura imbued by way of a literalist minimalism. The experience was truly amazing, but not long after I transported the suite of drawings back home, I realized that they failed to hold much resonance. The small drawings were still convincing to me though, and the haptic process mattered somehow in relation to their scale. They could be inventoried in a single stack, and I could hold and flip through them, one structure after another. I decided that this was the best way for the piece to live, and so I designed a cloth-covered box, blind-stamping it with “RECOLETA”. Perhaps it is a tomb for the unknowable. I continued to go back to Buenos Aires, and last year I completed a video about the apartment lobbies, called Language Barrier. George Perec, edited and translated by John Sturrock, Species of Space and Other Pieces, Penguin Books, 1997, p. 64. Jorge Luis Borges, Labyrinths, Selected Stories & Other Writings, New Directions Publishing Corporation, 1964, p. 114. Danny Aeberhard, Andrew Benson and Lucy Phillips, The Rough Guide to Argentina, Rough Guides, Second Edition, p. 122. View from my Las Heras apartment of Eugenia’s plants and a walk down Avenida del Libertador to arteBA, Buenos Aires’ annual art fair. The world over: cemeteries = cats. At this point my focus is on negotiating permission to perform the work in the Recoleta. I made the first large-scale mausoleum rubbing today and am enthralled with this activity and with being in this place. During our breaks in the cemetery, Hernán and I, perhaps irreverently, try to impress each other with an array of gymnastic moves and yoga positions—it has something to do with the fact that it is 38 degrees Fahrenheit and it takes five hours to complete each large-scale drawing. Today is a holiday and Hernán has graciously offered to take me to Tigre. En route to the delta, we walked around Las Canitas, hopped on a bus, and somehow ended up in Olivos—a suburban neighborhood where the president of Argentina lives. Another day of working in the Recoleta—and an evening in Palermo with new friends. There is a harmony to this heterotopia. Another day at the cemetery with the lovely Recoleta security staff. Next week, Buenos Aires will have a new mayor. My last day in the cemetery and an evening with friends. There is a neighborhood in Buenos Aires called Parque Chas. On a map of the city, it looks like a little spider’s web. It is a labyrinthine residential neighborhood with streets named after major cities: Londres, Copenhague, Dublin… I didn’t see Nueva York, but ready-or-not, I’ll be seeing it tomorrow.